The Griffieon farm, north of Ankeny, was designated a Century Farm in 2002. 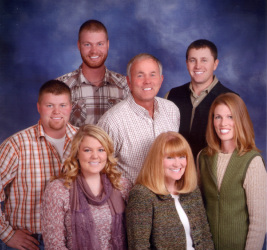 Our family has been farming in the Ankeny area since 1862. Our children are the sixth generation to live on the land north of town, the fifth to live in the home. We have a diversified farm with beef, chickens, turkeys, pigs, sheep and horses. We raise corn, soybeans, oats and alfalfa. Many Ankeny area children and adults have toured the farm since we began offering tours in 1987. Our children have raised pastured poultry for nineteen years. Our Limousin beef herd comes from stock that has been on our farm since 1960. Our meat has no added hormones, is antibiotic-free and humanely raised. Our goal is to produce a value-added product that "meats "the needs of our customers and sustains the environment. We rent four acres to area gardeners for vegetable production. Produce can be purchased from Yer Yang at the Uptown Ankeny Farmer’s Market. With urban growth pressure increasing upon our farm’s boundaries we hope to increase consumer awareness of the importance of the world class soils that exist around Ankeny. We also hope more people begin to realize the importance of local food security and a community based food system. It is important to know where your food comes from, and how it was grown and cared for. We hope you enjoy sustaining our family farm with every bite!